I think my body is finally telling me that I need to get some order back in my life. Since my mother has been in the hospital my normal routine of eating healthy has taken a back seat to just eating. The good news is that my mother will be going home soon and will be up and about almost back to her old self. The bad news is that my body is fighting back. This is a happy kidney. 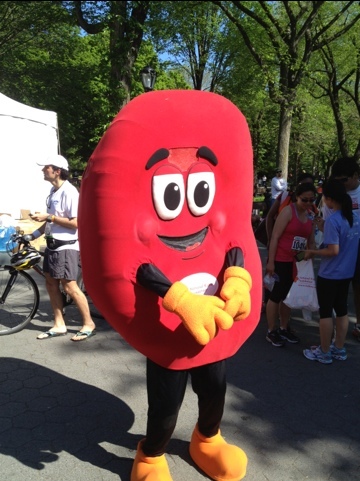 My left kidney does not look like this, I don’t think it has hands or feet. Aside from following the strict instructions from my doctor to keep running I haven’t been as great at making sure I eat healthy and now it’s catching up and my body is beginning to rebel. When I was 10 years old I fractured my right tibia and two days before I was supposed to get the cast removed I ended up in the hospital with a kidney stone. The doctors determined it was due to the extra calcium my body was producing to heal the fracture. Ever since I have been prone to kidney stone attacks. My last one was 7.5 years ago, right before I had my appendicitis and right when I changed my diet for good. Prior to that I would get an attack when eating the least healthy food possible and high stress moments. Last week I woke up in the middle of the night with that tell tale sign of the kidney stone attack. Thankfully it was a mild one and passed within an hour or so. Now I’ve got a pain from my right kidney. Before this the attacks were always on my left side. This time it’s a little different with pain only in the back. Don’t worry, I’m keeping a close eye on it and will get to my doctor if it doesn’t pass soon. Let’s all hope it does. Either way, this was the sign to get back to eating right. I may not be able to get back to eating at my usual schedule but if I can eat properly that will be a start. I am so ready for life to get back to normal! This entry was posted in Uncategorized and tagged healthy eating, kidney stones, kidneys, Stress. Bookmark the permalink.